We needed to scan the planet to find some other HepsNation action that did not occur in Eugene, Ore. over these last two weeks. We found some, and these results have some Olympic ramifications. 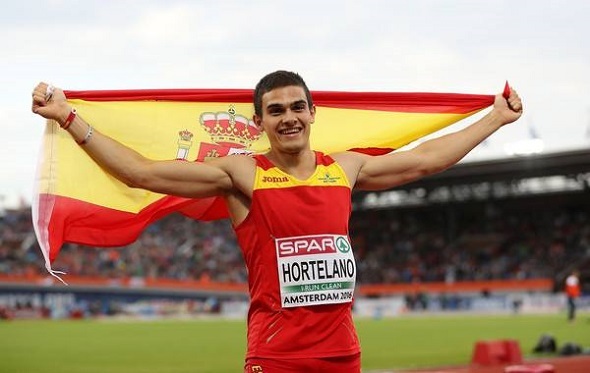 Bruno Hortelano used the European Championships in Amsterdam, Netherlands to improve his Olympic qualification time in the 200m. He set a new Spanish national record during the semifinal heats – 20.39 – to win his heat and set the second fastest time of the day. In the finals on Friday afternoon, he was clocked at 20.45 seconds into a headwind of -0.9 m/s. Now originally, he finished second to the Netherlands’ Churandy Martina (20.35); however, officials reviewed the tape and disqualified Martina after seeing evidence of Martina stepping on the inside line at the end of the curve, resulting in an upgrade to Hortelano. Hortelano wasn’t notified of his upgrade until a reporter asked him in the media zone about how it felt to win the gold medal and be a European champion… we recommend you watch this exchange and his reaction in this Twitter video. Joining Hortelano at the European Championships were Alexi Pappas and Peter Callahan. Pappas wore the Greek national uniform for the first time in the women’s 10km final where she finished 11th overall in 32:27.80. She would have placed higher had she not suffered a fall during the race. Two days later, she competed in the 5km final where she finished 11th in the field with a time of 15:56.75. Callahan also wore his new national uniform for the first time. Representing Belgium, Callahan raced the 1,500m. He just missed qualifying for the finals by 0.5 seconds as he ran 3:41.75. Also on the European continent, Princeton’s Julia Ratcliffe snuck in one final meet on July 9th in order to achieve the Olympic standard before qualification deadline of July 11th. She went to London and competed in the Southern League meet where she threw 70.75 meters (232-01 1/2). While it is a new personal best and New Zealand national record, it is short of the Olympic standard by 25 centimeters (about 10 inches). Ratcliffe needed to hit that standard in order to be considered for selection on Team New Zealand. We will see if she is included on the national roster when they update it later this week. In a warmer climate, the Jamaican National Senior Championships took place from June 30th to July 3rd where two former Heps champions finished as the runner-ups in their respective events. On the first day of the competition, Princeton alum Damon McLean (Princeton ’14) set a new personal best by 4 centimeters in the triple jump final – 16.46m or 54-00. Harvard’s Nicky Grant (Harvard ’02) threw 57.34 meters (188-01 1/2) on her first throw of the competition that ended up being the second best throw in the entire competition. Grant is a six time national champion in the hammer throw. Unfortunately, neither athlete has the Olympic standard. Other Heps athletes in action in Jamaica included Darryll Oliver (Penn ’11) and Erison Hurtlault (Columbia ’08). Oliver finished 10th in the 800m preliminary round in 2:01.39 while Hurtault – who represents Dominica in competition and was invited to compete – ran 47.46 in the 400m prelims (27th place). To the north, underclassmen Marc-Andre Alexandre (Yale) and Taysia Radoslav (Cornell) made it to the finals in their respective events at the Canadian National Championships & Rio Selection Trials. Alexandre – a rising senior – was sixth in the men’s 400m final with a time of 47.36. Radoslav – a rising junior – finished sixth in the 400m hurdles with a time of 57.63. This entry was posted on Monday, July 11th, 2016 at 6:48 pm. It is filed under Alumni, Spotlight. You can follow any responses to this entry through the RSS 2.0 feed.